Grill chicken 5 to 7 min. on each side or until done (170ºF), brushing occasionally with 1/4 cup dressing. Meanwhile, combine remaining dressing with remaining ingredients. 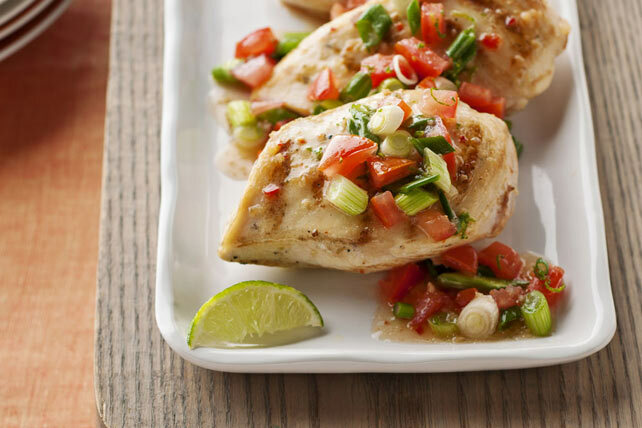 Serve chicken topped with salsa. Enhance the salsa by adding any combination of the following ingredients: 1/2 cup chopped avocados, 2 tsp. chopped fresh cilantro, and/or 1 tsp. chopped jalapeño peppers. Fire up the barbecue. Not only is this quick-and-easy salsa the perfect topping for the grilled chicken, but it can also be part of a healthful eating plan.